As you will come to see, I am a huge fan of any foods from or relating to Mexican, Southwestern, or Tex-Mex cooking and as a result Lisa Fain’s blog (and cookbook) The Homesick Texan is one of my favorite places to visit. When I saw this recipe I thought it was just too good to be true – how could cookies that have no butter and no flour be good!!? Oh they can be more than good, they can be chewy, gooey, and still have a perfect crunch to their outer layer. Dang. My mouth is watering just thinking about them! The chili powder can easily be excluded but I highly recommend it, as it adds a subtle heat at the end that perfectly compliments the sweetness of the chocolate. I also recommend having a glass of ice cold milk on hand for when they come out of the oven. Preheat oven to 350˚F. Once it has heated up, toast the pecans until fragrant, 5-10 minutes, and set aside to cool. In a mixing bowl, whisk together the confectioners sugar, coco powder, salt, and cinnamon. With a spoon or small spatula, stir in egg whites and vanilla until everything is moist. 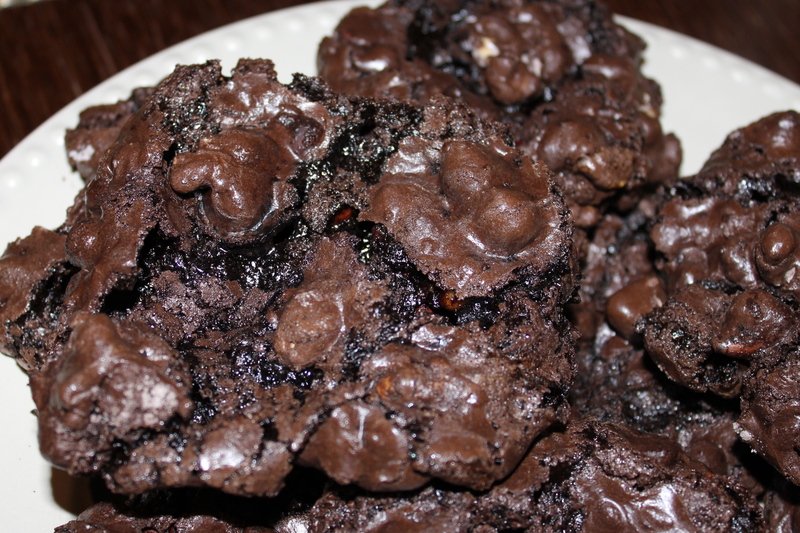 Mix in the chocolate chips and pecans. On a parchment-lined baking sheet, spoon out dollops about the size of a ping pong ball. Bake for 12 minutes, or until the cookies look crackled on the surface.